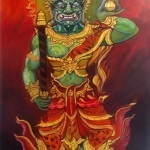 Thai Buddhist Fine Art, Contemporary Sacred Art Paintings,Thai Occult and other Original Masterpieces, for your Selective Choice. 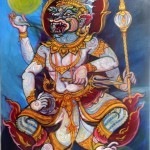 We are now proud to expand our services to provide You with some of the most amazing and beautiful Thai Buddhist, Sacred, and Occult Art for your collections. All Art in the store on this page goes through a Separate Store also owned by Ajarn Spencer Littlewood. 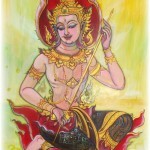 Ajarn Spencer Prefers to Keep each Genre (Amulets and Art) as Separate websites, for indeed, the Thai Buddhist Art website is also a Long Reaching Project which plans to promote and increase the Interest and Collectorship for Thai Buddhist Art, and to help the many great Thai Artists and Artisans to find International Avenues for their work to be displayed and collected. You will need a different Log In for a Customer account with this store, as it is not connected to Thailand Amulets/Net store. However, it is We, the same people you know and trust, who serve you from both stores. 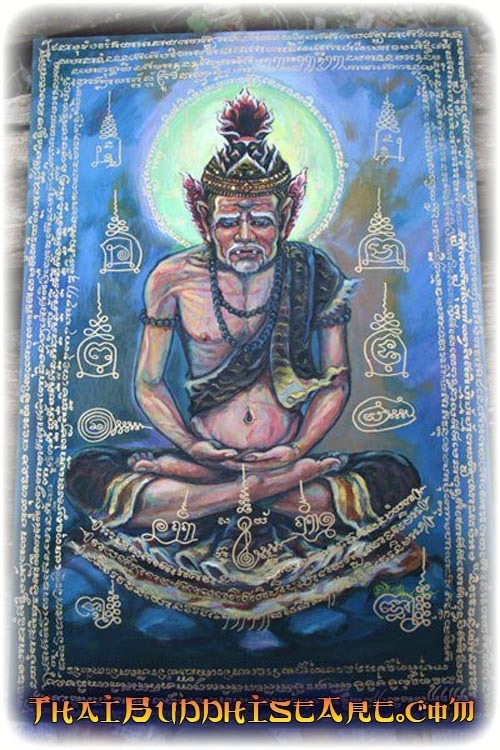 You will notice that we are stocking a great many sacred Art paintings of the Ruesi Hermit Gods, which we have commissioned from one of our House Artists, Ajarn Saeng. 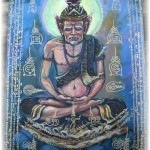 Ajarn Saeng provides many of the Sak Yant Offices with Paintings of Ruesi hermits for their samnak sak, and even for Temples. Now even You can have such a work of art and Bucha Image to hang on the wall of your places of worship, or to have as Art on Your Wall. 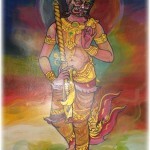 We can arrange for sacred Inscription of Khom Agkhara Lettering and Blessings on the Painting if wished at extra cost. 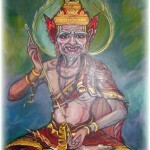 More and more hermit God paintings will be constantly added as the Art Store galleries are developed. Ajarn Spencer is trying his hardest to develop things as fast as he can. 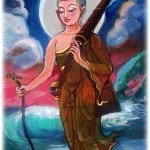 Por Gae Narot Long Khong – Naradha Rishi with Sak Yant Instrument – 60 x 40 Cm – Ajarn Khamang Saeng Apidej.